“St. 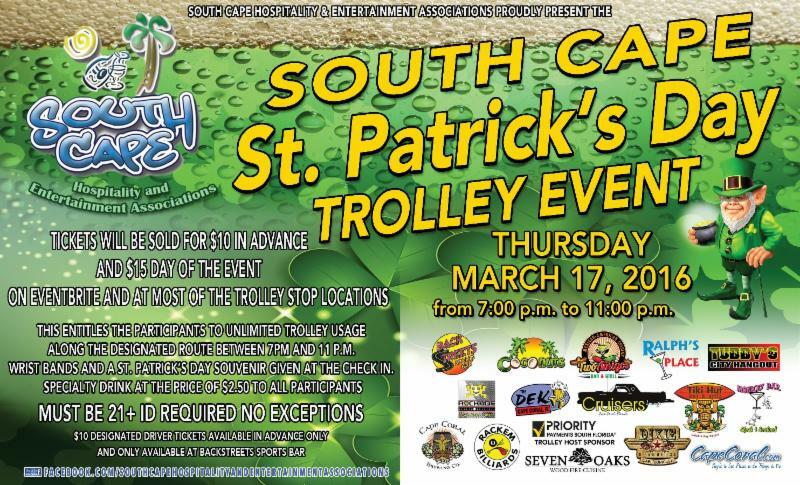 Patrick’s Day TROLLEY EVENT 2016” which will be held on Thursday, March 17, 2016 from 7:00 p.m. to 11:00 p.m.
That’s when 14 of the South Cape’s best restaurants and bars come together to offer a unique way to have fun celebrating St. Patrick’s Day South Cape style. Participating locations will offer a $2.50 drink special to participants as they travel on a fleet of trolleys around the South Cape. There will also be a drawing for a basket stuffed with a Guinness, Jameson Irish Whiskey, Bailey’s and pint glasses to serve it all with style. In addition to the drink specials and the St. Patrick’s basket drawing, many of the stops will have live music and/or other specials for you to enjoy plus a St. Patrick’s Day souvenir for you to wear. and most of the participating locations listed. At each stop, participants will have their passport stamped, no purchase necessary-but you must have your passport stamped at every location to be eligible for the basket drawing. At the end of the evening, turn in your completed passport for the St. Patrick’s basket drawing. The check-in booths open from 6:00 pm to 7:30 pm and will be located in Club Square, and Big John Plaza. Attendees may check-in at either in Club Square or Big John Plaza and then pick up the trolleys at their favorite location and ride to all the other locations. Did you know the Holiday Inn Express, Hampton Inn, Dolphin Key Resort are all within walking distance of this event? Spend the night in South Cape and make a safe night out of it! This entry was posted in Real Estate and tagged Cape Coral FL, Cape Coral FL homes, cape coral fl luxury homes, Cape Coral FL realtor, Cape Coral Florida homes, cape coral foreclosures, cape coral golf homes for sale, cape coral happenings, cape coral home for sale, Cape Coral homes. Bookmark the permalink.